What is the most important thing you can tell me about your project, web site, company, or self? The ability to find the core is as important when describing a project as it is in planning one. 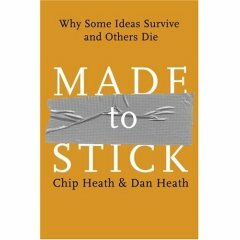 Made to Stick is essentially a book about communicating ideas. You need to find the central point that matters–the substance. Then make it sticky–memorable. The core is the central essence, the most important aspect. Compact is how you need to describe it. Made to Stick suggests using a proverb, a short phrase that is easy to remember and share. Local newspapers: “Names, names, names.” If you are reporting for a small-town paper, printing names of residents is the most important thing. Much of this post comes from the first chapter of Made to Stick, “Simple.” With a name like that, I had to love this book. Lots of great examples, actionable no matter what you do, because who couldn’t benefit from communicating their ideas better?